THE HEAT of the excitement has become feverish as the Philippine Inter-City Basketball of North America (PIBNA) is set to roll into Florida's hardwoods on Labor Day weekend. From September 3-4, 2011 about 95 teams from 17 cities in North America will vie for 10 division titles, including the much coveted Men's Open Division. FilAms and basketball fans of all ages will get the chance to experience raw brawn and talent of Philippine basketball at its best as the famed basketball league sets the stage to determine the best of the best of Philippine Basketball in North America. 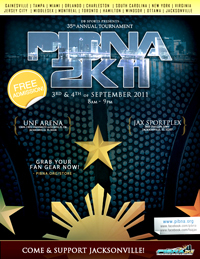 PIBNA is an organization of Philippine basketball associations in North American cities, each led by a city commissioner. This year's host is Jacksonville, which also happens to be a juggernaut in the league. 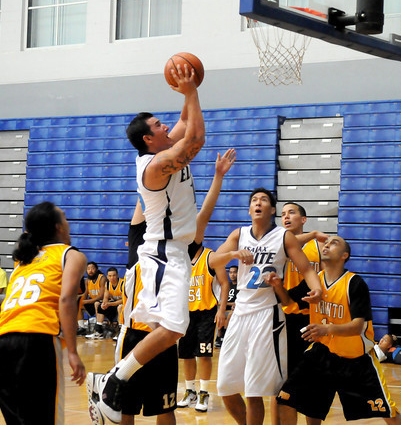 The Filipino Sports Association of Jacksonville (FSA Jax) represents the team participants in all divisions. FSA is headed by Dickson Blancas, who is also a member of the PIBNA Board of Directors and is the PIBNA city commissioner for Jacksonville. "FSA Jax, playing on its home turf is a heavy favorite in the Open Division," said Blancas in an interview with Basta Pinoy News. "I'm not being biased, but since we joined in 1997, our record speaks for itself." Indeed, the man is not firing blanks. To buttress his prediction, Blancas cited the stellar record of his team since 1997. It has racked up 9 Division tiles, 7 of these in the premiere division -- the Mens Open, the others in the Womens and 5'10 and under.